Craniosacral therapy, a gentle manual technique developed by John E Upledger, uses the craniosacral rhythm to communicate with the body. For example, a skilled therapist places their hands in certain spots in the body to feel the craniosacral rhythm. When they feel an area where the rhythm does not flow correctly, the therapist knows this area needs attention. This therapist then feels the changes in the rhythm to guide the session and decide what the patient needs. This technique allows the client to guide the session and the body to heal itself versus the therapist “fixing” the patient. What is the craniosacral rhythm? The craniosacral rhythm is the rhythm of the cerebrospinal fluid flowing through ventricles in the brain and down the spinal cord. First, this fluid helps remove metabolic waste from the brain back to the bloodstream. Also, it serves as a cushion to the brain, protecting it from head trauma. Finally, it travels through the body every five to ten seconds, and the therapist can feel it with light pressure on the body. However, damage to the body will change the feel of this flow, and the practiti oner will know where to work based on how the rhythm feels throughout the body. 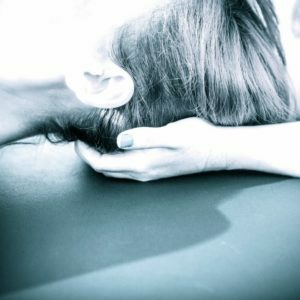 Craniosacral therapy involves gentle pressure used throughout the body and skull to help return the craniosacral rhythm to its natural rhythm. A craniosacral therapist does not fix someone or heal someone. Rather, they provide a space for the client to heal themselves. When the craniosacral rhythm returns to its natural flow, the body can heal itself. Clients report feeling extremely relaxed and clear at the end of the session. Other reported benefits include decreased insomnia, decreased headaches, improvements with neck, back and TMJ pain, decreased stress and anxiety. Clients often report feeling more alert and present after a session. In conclusion, craniosacral therapy’s gentle approach often leave people shocked by its effectiveness. These subtle adjustments often provide surprising profound effects. Is there any research on craniosacral therapy? Recently, researchers studied football players who suffered from Chronic Traumatic Encephalopathy (CTE), the medical term for multiple concussions. They found decreases in symptoms of CTE including decreased pain, insomnia, depression, and improved ROM. This research supports what many clients report. I recommend clicking here for more information on craniosacral therapy. I also recommend reading: Your Inner Physician and You, by Dr. John Upledger to learn more about how your body heals itself! !